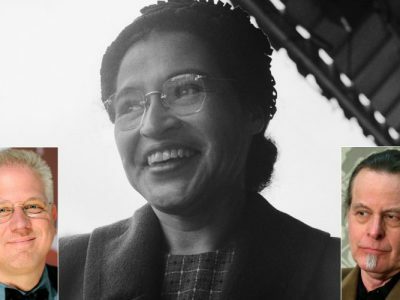 Honoring Rosa Parks is important, but when you cross over into comparing yourself with her, it’s time for a reality check. Strangely, this has become a particular twitch on the far right—folks who couldn’t be getting their history more wrong. This repeated misappropriation came to mind while watching President Obama speak today in celebration of the civil rights leader, who has been memorialized with a statue in the Capitol Hill rotunda, the first black woman to receive that honor. It’s a marker of how far we’ve come as a country: a domestic worker honored as a national hero and a symbol of civil resistance. From our vantage point, it’s easy to forget that in her time Parks was seen as a controversial troublemaker. She was called a communist agitator and worse. Only in recent decades has the moral clarity of the civil rights movement seemed self-evident. Which is why it’s so fascinating to see conservative populist activists liken themselves to Parks as a way to paint themselves as a victim of society in the Obama era. To be clear, this is a leader of conservative populists urging the then-rising Tea Party movement to see themselves as the inheritors of the civil rights mantle—against the first black president. There are so many ironies at work that it hurts. In 2011, in an even more distant moral zip code, where evil and irony hang out, a neo-Confederate speaker in Alabama followed a reenactment of Confederate President Jefferson Davis’s swearing-in ceremony by invoking Rosa Parks. Seriously. The “people of the Confederacy have been forced to move to the back of the bus,” said self-styled “Lt. Commander in Chief” Kelley Barrow at an event attended by 1,000 people in Montgomery, the site of Rosa Parks’s famous protest. This more than anything shows who won the Civil War: a thousand loons celebrating the Confederacy, which fought to preserve slavery, citing the moral example of a black woman who helped remove its last vestiges of segregation. There are many other examples—Sarah Vowell wrote a great 2001 essay for Time, which I found while researching this column, that detailed the absurd Rosa Parks comparisons up to that time, including country music star Larry Gatlin comparing then-Florida secretary of State Katherine Harris with Parks after the contested 2000 election recount. So what’s the deal with this impulse? For one thing, it shows an overhealthy self-regard that crosses into delusion. In the current round of misappropriations, there are certainly liberal activists who don’t hesitate to compare everything they do to Parks and Dr. King. But the impulse from folks on the far right is an especially twisted irony driven by a pervasive sense that they are victims in Obama’s America—persecuted just like the civil rights heroes of old, who were actually viciously persecuted by the conservative populists of their time (who were then mostly Democrats). Bottom line: There is a world of difference between feeling persecuted and discriminated and actually being persecuted and discriminated. Rosa Parks is Rosa Parks. Honoring her example elevates us as Americans. But doing so without bothering to look at a history book is an insult to her legacy of struggling against institutionalized bigotry.